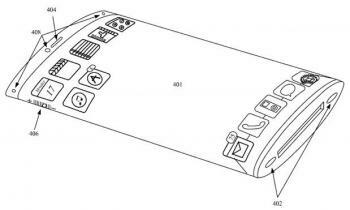 The USPTO unveiled a new patent application by Apple, that describes a mobile device that features a wrap-around flexible AMOLED display (yes, the specifically say it's an OLED display). The whole device is wrapped with the display. The patent also describes a mechanism that determines which parts of the display to use using a camera and a facial recognition software. An OLED is obviously the best choice for a full-color, flexible display that can be efficiently turned-off in some areas. Apple's patent also describes an option to include multiple transparent displays, overlaid on top of one another. I'm not sure I understand the advantages of using several transparent OLEDs one on top of the other (except for the creation of 3D images). The device shown above represents just one of the concept device designs - Apple also describes "regular" rectangle devices and a cylindrical device. According to the patent the phone body may be totally transparent (made entirely of glass, for example). So, yet another OLED patent from Apple. Tim Cook may claim that OLEDs aren't good enough, but the company is still fascinated with the possible designs OLEDs enables. Just last month we posted about another Apple patent describing a flexible OLED screen that can turn into a warp-around bracelet using a bi-stable spring. In past years we reported on many OLED patents by Apple including a flexible OLED based haptic display, OLED based BLUs for LCDs, OLED control schemes and others. A few weeks ago it was reported that Apple has hired a new executive into its Display group - Dr. Jueng Jil Lee, a former research fellow at LG Display, who apparently was involved with OLED TV printing technology research. Is Apple getting closer to their first OLED product? It's again a so weak patent ! 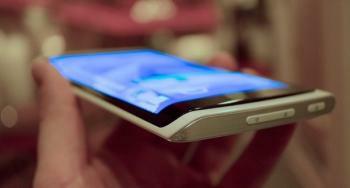 A flexible wrap OLED display on a phone, where is the invention? It will be the same for all common objects? It remind me weak LG patents about OLED TV. How it's possible to publish an IP about a simple association of 2 or 3 exisiting products?